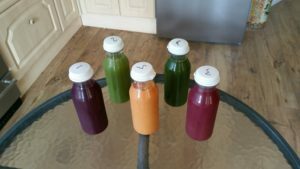 On Friday 16th March 2018, I will be starting the Ten Day Total Reset detox programme (see http://10daytotalreset.com/) I will be having 3 colonic hydrotherapy sessions and living on green juice during that time. I have been told it will be tough but that I will definitely feel the benefits. And so this review will consist of a daily blog about my treatments and how I’m feeling. And I understand that some days I’m likely to feel like s**t! Click here for background information about the project. Sugar. Not a problem for me. I have very little refined sugar. Caffeine: I’ll miss my morning cuppas but I normally only have a couple with caffeine and then go decaffeinated. Wheat: A little bit more challenging. I normally eat sourdough or low GI breads, but they are still wheat so lunch will have to be reconfigured. Dairy: That’s more of a challenge. I drink goat’s milk, love Greek yoghurt and I’m quite addicted to cheese. Don’t tell anyone. I’ve been quite good, but did have a little bit of cow’s milk in my decaf coffee this morning because I was at an event, and I’ve dolloped yoghurt on desserts a couple of times on auto-pilot! At 9am I had juice number 1 for breakfast. The ginger and lemon gave it quite a strong flavour but pleasant enough. Sadly, not as nice as my normal bowl of muesli with extra blueberries, coconut milk and yoghurt. And a cup of coffee of course. 10:30am. I’m feeling slightly light-headed, but I think that’s probably psychosomatic as I just made coffee and toast for Mike and the builder. Mike is out for dinner tonight and tomorrow so that will make it easier. I think a few (quality) ready meals might be in order for next week for him. Not something we normally have but special circumstances! 11:15am. My first ever colonic treatment. I was a bit nervous but there was no need to be. The sensations were ‘strange’ but not unpleasant and not uncomfortable. And Ann-Marie talked me through what was happening the whole time. She said that even though I was in fairly good shape and quite slim, there was a lot of mucous coming away and quite a bit of old food. And surprisingly, although I don’t normally feel bloated, she could feel the difference in my stomach. Perhaps I’ll have on flat-board tummy at the end of the treatment? But no, obviously I’ll need to do some exercise too. Ann-Marie gave me a probiotic as I left and I got home in time to have juice number 2. 5:45pm. Just having my fourth juice. I felt really hungry earlier on but that seems to be subsiding. I feel fine now. I’m amazed. I woke up feeling bright and breezy and quite energised. And I think my tummy is flatter too. So far so good. Although I’m under no illusions, I am sure it will get tougher. Claire dropped off my juices this morning so the same routine as yesterday. I’ll let you know if anything changes. I felt a little bit sicky this morning. Not much so can’t complain. I felt better during the course of the day. A slight change in the juices today: two green juices, 1 beetroot,1 pure carrot juice and a spicy broth which I really enjoyed. Just having juices was harder today as Mike was home and I cooked him lunch and dinner. Maybe that’s why I’m feeling a little bit hungry, but only a little bit! Claire delivered the juices again this morning. 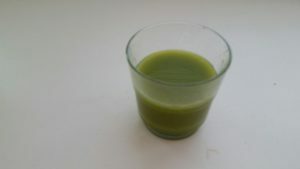 Another slight change: there’s a broth again – that’s good – and a juice with spirulina and other herbs designed to draw out the toxins. Again, I felt a little bit sickly when I got up but I’m fine after having my first juice. Feeling fine and sleeping well. And I’ve lost about 6lbs. It is the first time I have weighed less than 9st for years. And a treat today: I have two warm ‘juices’ – a broth and a soup. Yes, in my current detox world, that really is quite a treat! Since Hippocrates is considered the father of modern medicine, it certainly makes one wonder why the mainstream medical world pays so little attention to diet and gut health. GPs virtually ignore diet, hydration and gut health. The NHS might talk about healthy eating, but hardly sets an example in the food they deliver in hospitals. And they still say red meat should be part of a healthy diet, although numerous studies indicate otherwise. Did you know, for example, that doctors have virtually no nutrition training in all their years of study? Halfway there. Hooray!! But I’m feeling great. When I woke up this morning, I really woke up, none of that bleary-eyed stuff for the first half-hour. My skin tone is improving too. Sadly it hasn’t got rid of the wrinkles, but that might be expecting a bit too much!! Claire delivered my juices this morning with an instruction to start with the watermelon juice, which was absolutely lovely. I’ve had a mega busy day and only just finishing now at 8:30pm. So pretty good so far. It has been a really interesting day. I was exhibitng at a big meeting this morning so I was up before 6pm and only had about five hours sleep. I normally need eight hours sleep and hate early mornings. But guess what – I felt absolutely fine this morning. And felt better still when so many people I know told me how good I was looking: a healthy glow someone called it. And I like today’s selection of juices: watermelon again to start and a lovely carrot soup for either lunch or dinner. A challenging day today – but nothing to do with the detox! I’ve been clambering around in cupboards under the stairs gloss painting! But all still going well with the detox. Nearly there! I’m feeling great but looking forward to being able to eat again. My last day – fantastic! It’s actually been one of the more difficult days so far. I really feel as if I need to eat today and I haven’t felt like that before. Sure, I’ve wanted to do – but need is different. But I’ve lost 10lbs and as I wasn’t particularly overweight to start with, that’s quite a lot. 5 pm. My last colonic of the series! Claire is there to advise me on the best way to introduce normal food back in to my diet. Obviously my stomach has shrunk and the gut is clean, so it needs to be a gradual re-introduction and definitely avoid the nasties of caffeine, wheat, dairy and sugar for a few days. Ann-Marie takes one look at me, stares in to my eyes and says: “OMG – I can’t believe how white your eyes are.” I hadn’t realised but yes, the whites of my eyes really are very – white! A good health indicator I understand. After my last colonic, I’m feeling really great again and skip out of the clinic. I’m looking forward to my supper. I finish of the last vestige of the 10-day detox: a carrot soup, but now enhanced with Mediterranean vegetables and a few baby potatoes, followed by some fruit a little later. I’m feeling fantastic, sleeping well, my skin looks good and as soon as my eyes open in the morning, I’m wide awake. And, of course, I’ve lost some weight. Turns out that is a timely bonus for me: I’m happy to put about 6lbs back on and as I’ll be away on holiday soon it gives me a little bit of leeway…. Would I recommend the Ten Day total Reset. A resounding YES! !